In 2003 AUBG took a new step in fulfilling its mission of educating the leaders of tomorrow, a step beyond the Blagoevgrad campus. Building the Elieff Center for Education and Culture in Sofia and establishing the Executive Master in Business Administration certainly had its challenges. 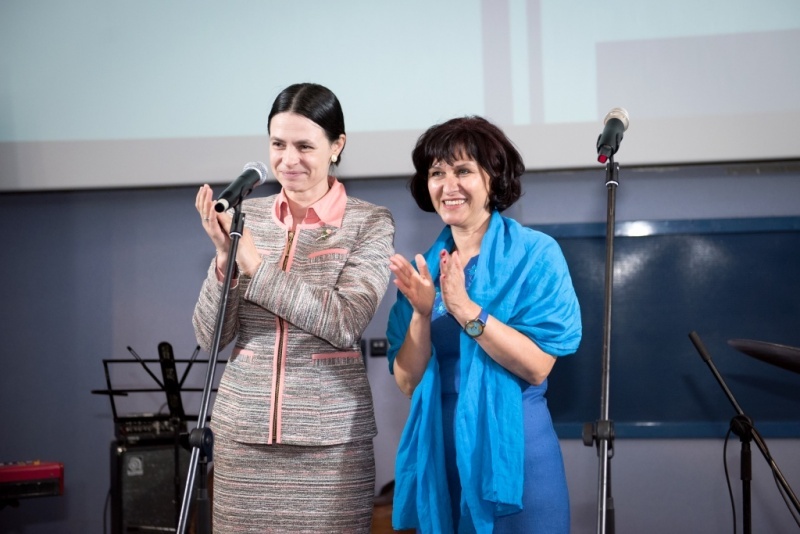 Fifteen years later, however, AUBG’s EMBA has become one of the leading executive programs in Eastern Europe, while the Center continues to grow into a unique hub for education in the capital’s Studentski Grad district. To honor this milestone anniversary alumni and professors returned to Elieff Center on May 10 for a special celebration. “We hope the program has transformed your lives and you look back on the weekends without a weekend, and the nights without sleep fondly, even if you didn’t at the time,” said AUBG President Dr. Steven Sullivan. He greeted the guests alongside Provost Emilia Zankina, the university’s Special Envoy President Rosen Pleveneliev and Board of Trustees Deputy Chair Amabassador Elena Poptodorova. Poptodorova took a moment to remember Eliot Elieff, a great supporter of the university and eponym of the building. Elieff was one of those Bulgarian immigrants who left the country in the early 1900s but forever kept his home in his mind. It took a lot of trips to his California home and a lot of traditional Bulgarian rakia and salad to clear all details, Poptodorova remembers, but in the end the center was built. This was the first time in modern Bulgarian history that a private donor supported higher education since the Georgievi brothers laid the foundations of Sofia University, President Plevneliev later noted. “We did have a number of challenges, a number of uphill battles until we got the systematic program with cohorts. And today I could not be happy and strong enough in my words to express how rewarding this effort has been,” Poptodorova said. In recent years Elieff Center has expanded its mission with multiple new programs. It is now the home of the joint venture Executive Master in Finance, Banking and Real Estate with SDA Bocconi, the Sustainability Leadership and Innovation Program, the English for Journalists initiative of the U.S. Embassy in Sofia and, of course, the Executive MBA program. In honor of the EMBA’s anniversary, alumni were invited to look back at their studies and select their favorite teacher. After an online vote, the first My Favorite Professor Award went to Yusaf Akbar, instructor of International Business and Business and Society. “I’ve had the privilege and honor of working with every single group that’s come through the program. I’ve learned so much about so many things because I’ve worked with incredibly hard-working, intelligent and insightful people,” he said in a video recorded especially for the occasion. The celebrations for the evening climaxed with a live auction, hosted by alumnus Hristo Chernev (’99), where guests bid on artwork done by AUBG undergraduate students and Elieff Center memorabilia. The funds gathered totaled almost 10,000 BGN and will go to the establishment of the Young Entrepreneur Endowed Scholarship for undergraduate students.